Oftentimes it seems like celebrities start taking themselves way too seriously once they reach a certain level of fame. 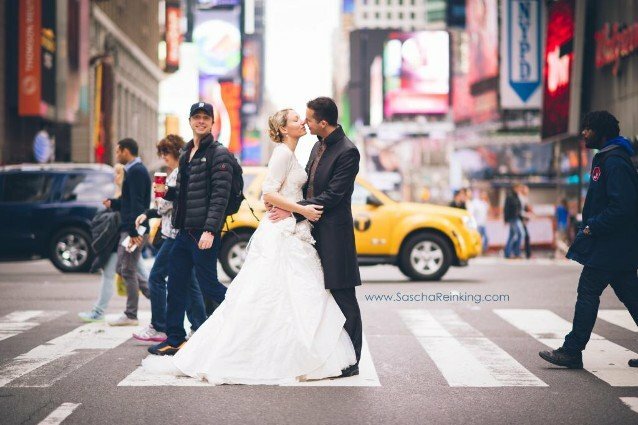 Zach Braff apparently didn’t get that memo – he regularly interacts with his fans and recently he managed to photobomb a wedding picture – the one you see above. Here’s hoping that the two newlyweds were Scrubs fans, otherwise they will probably be asking the photographer to Photoshop out the goofy looking dude in the baseball cap. It’s not just Braff that’s doing stuff like that. Donald Faison, who is his former Scrubs co-star and also his best friend, is the same way – not afraid to act silly in public. In fact photobombing seems to be a big thing, with the participants ranging from Amy Poehler and Tina Fey to basketball superstars Chris Bosh and Dwight Howard. It’s just their way of reminding us that we can be silly to each other no matter how much money or popularity we may have (actually, Donald Trump would probably not react well to a photobombing nor would he photobomb anyone). While Braff’s photobomb was epic, the best one of all time has to go to Faison just for his target. Recently, there was a red carpet event going on and Tom Cruise was there, doing his Cruise thing – you know, flashing that big grin and generally giving the impression that he’s in his 30s rather than his early 50s. Flashbulbs were going off and the movie veteran was in his element … except for the fact that Faison’s head and upper torso was bursting into the background from behind a curtain. The fact that the victim was the same guy who had jumped up and down on Oprah’s couch made it all the more glorious. Perhaps this will become even more prevalent. Social media apps like Instagram and Twitter have played a big part in it – the reason that the Braff photo became such a sensation was because the photographer tweeted the picture and mentioned Braff’s Twitter handle – which then made it viral. The celebrities can actually act like their own paparazzi by taking pictures at candid moments and post them immediately to their followers. Who knows … but the more that it happens, the better it it is. This can serve to lower the pedestal that they perch upon. We all know that, but seeing them either on the television or movie screens or on a stage makes them feel much larger than life. So, people, when you’re outside taking pictures, especially if you’re on a crowded street in Manhattan or Hollywood, look closely at the people in the background. You never know who you’ll see.